Red Turnip Theater has a tendency to stage plays with complex emotional subjects at the core of the story. And thus they tend to be plays that try to shake you out of your comfort zone, maybe even disturb you a bit, but all to convey some important bit of meaning or significance. And this play is no different. A Doll's House Part 2 is the latest Red Turnip offering and one that I had quickly booked seats for even without knowing much about the play itself. It was to my surprise to find out that this is actually a sort of sequel to a book but written in a manner that doesn't require one to read the original book to get a better perspective on things. I already had tickets in hand when I find out about this (as I was curious as to why it was a 'part 2') and that just got me more curious as to what it was all about. And over the weekend we finally out that book to rest and we came out better for it. 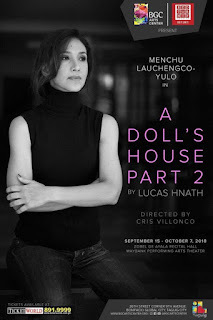 Synopsis: A Doll's House Part 2 is a play written by Lucas Hnath and is a sort of sequel to Henrik Ibsen's A Doll's House book. The Red Turnip Theater staging of this play was directed by Cris Villonco and was staged at the Zobel de Ayala Recital Hall at the BGC Arts Center in Taguig from 15 September to 7 October 2018. At the end of the book, the wife Nora (Menchu Lauchengo-Yulo) had walked out on her family and effectively ended her marriage. Some 15 years later she finally returns home pretty much a different woman. This return was coordinated with Anne Marie (Shiela Francisco), the family nanny who had once raised Nora and went on to raise her children after she had left her husband. Nora has done fairly well for herself and is now a published and successful author who had used her negative experiences at home to write a rather emancipating piece of fiction from a woman's perspective. After initial pleasantries it is revealed that the reason for her return boils down to the fact that her husband Torvald (Carlitos Siguion-Reyna) had never filed the paperwork for their divorce - something that she had assumed he would handle as it is much harder for a woman to provide the government with valid reasons for her to leave her husband. And this is where the central conflict of the play lies as she now needs to get her Husband to finally separate them in the eyes of the law but it's not quite as simple to do this as she had imagined. But she remains determined to do this in order to live the life that she wants for herself and avoiding the possibility of prosecution for behaving as a single woman. What I Liked: The women of this play were all pretty powerful performers but I think Shiela Francisco's performance as Anne Marie especially stood out. You could clearly see the complex interplay of the different emotions of her character with every new revelation from Nora in their scenes together. You could see her happy smile turn somewhat awkward and uncomfortable then ripple into a mixture of fear, regret and anger. This was all matched perfectly by her delivery, thus completing her overall performance. I was rather surprised by Rachel Coates, who played the daughter Emmy. She was brilliant in her portrayal of the precocious young woman and managed to share the stage well with the venerable Menchu Lauchengco-Yulo. Plus she did amazing justice to the lines written for her character in what was clearly a well thought-out and rather complex play. And all this was necessarily to present adequate folks for Nora's strong beliefs about the injustice on women that marriage represents and the opposing views by other characters, including her estranged daughter Emmy. Special shout-out of love for the sort of title cards used to stress the different character names - excellent use of a projector that made things feel like an art film. What Could Have Been Better: I had rather mixed feelings about Carlitos Siguion-Reyna's performance as Torvald. At times his accent sounded distinctly local before shifting back to something more neutral for other lines, thus highlighting the shifts. He certainly did his best to convey being the worried, insecure man that Torvald is, but this meekness took away from some of his other lines as it would swallow up his lines. The way the entire stage was setup was very tight, mainly because of the size of the theater. But that also meant some unusual sightlines for different seats in the theater and the option to really examine the limited set pieces, these being the two chairs that get moved around a lot. I don't know if it was intentional that they chose some pretty old-looking chairs despite talk of Torvald having done well for himself or the chairs were merely representative of what the house could be like. It was just a bit distracting a times, especially from the front row. TL;DR: A Doll's House Part 2 is a rich, deep play that talks about marriage, divorce and the role of people in a relationship from many different directions. The cast worked together to deliver an amazing performance and this is certainly going to be a play that we're not likely to forget any time soon. And thus it gets a full 5 micro-expressions on Anne Marie's face out of a possible 5.